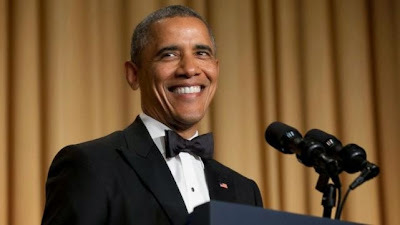 Obama gave a very good performance at the Correspondents Dinner, he did everything but sing and dance. Of course it was an audience that loves him, the press. The ultra liberal Huffington reported each separate quip in a separate article. The left gushed that he bashed the entire Republican field. What a performance, but, unfortunately, he's President. In that role, objectively, things aren't going so well. We now have a Middle East policy that's only reactive at best. While terrorism is becoming more and more widespread, he still wants to close Guantanamo Bay, and afford our enemies an OJ defense in NYC. While he himself now calls The Affordable Care Act Obama-Care, and considers it his legacy, doctors are retiring in record numbers, because of the paperwork and reduced compensation. His support is based on personality, not on performance; That is his true legacy.